Bees make more than honey. They also make a waxy substance called propolis. And this “bee glue” is a powerful health balm. In fact, studies show it has anti-cancer properties. In addition, propolis was found to mitigate the side effects or toxicity of chemotherapy drugsused in the treatment of cancer. And propolis doesn’t just benefit bees. For thousands of years folk medicine practitioners have used bee glue to treat abscesses, heal wounds, and fight infection. In fact, propolis was listed as an official drug in the London pharmacopoeias of the 17th century. 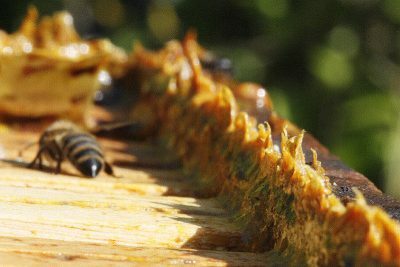 Modern studies confirm a long list of health benefits offered by propolis. A search of PubMed shows over 2,000 studies on bee propolis. Here are just a few of its health benefits. By the study’s end, 24 out of the 30 patients in the propolis group had healed. Only 14 of 30 in the drug group, and 12 of 30 in the placebo group were cured. Like honey, the composition and health benefits of propolis will vary depending on the trees and flowers and the location where it is produced. You can find propolis in its raw form directly from a local beekeeper. It’s also in the “cappings” of honey – a crunchy mixture of pollen, propolis, and bees wax. Propolis is also available without the honey. But extracts or tinctures of propolis are more convenient to use. They are popular for boosting the immune system, and for their anti-inflammatory, antioxidant and anti-microbial properties. You can also find propolis formulations for colds and flu-like symptoms, wound healing, acne, cold sores, genital herpes, and dermatitis. They are available as creams, ointments, lotions, toothpastes, and mouth washes. Oral propolis formulations can be found as pastes, lozenges, liquid extracts, tablets, and capsules. However, if you have an allergy to honey or bees, you may also have a reaction to products containing propolis.